Inspired by both the aggressive unification images of hectic times past, as well as a panic ridden guilt. I created this as an outlet for myself as much as be a symbol for progression. There are issues I my country currently, and in some case I’m very near to the turmoil. My city seethes, sometimes subtly, with racism and bigotry amongst other things. For me, I know I am in a seat of power, or at least control, by genetic and gender default. I have a big problem with this because I do not understand the horrendous actions of my kind, and the unfairness and inequality they treat others with. It is foreign to me, such hate. I am not saying I am incapable of hate, but I do not base it on things like race, gender or whatever. Hate is permanent anger to me. One can get angry, hopefully briefly, and channel frustrations in a healthy manner. If one does not, hate emerges and finds a permanent residence. Sensitive to these situations, I became distraught as to what I could do for and with allies and compatriots of the movements that seek to level the field of favor for all people. Aware that I am an individual the world has stacked the cards in favor of, I began to ask myself, “What can I do?”, “How can I contribute?”, “What am I prepared to do?”, etc. I make the phone calls and send the emails and letters to those elected to deal with such things, but there needs to be more. Things aren’t happening fast enough, and in my own connected and eclectic ways I reach out and take actions to encourage such change. In my headier solitary moments as I steel such resolve, I create. This graphic came about in this way. Rest assured, if this image shows up on a t-shirt at a rally against such bigotries… I had something to do with it. 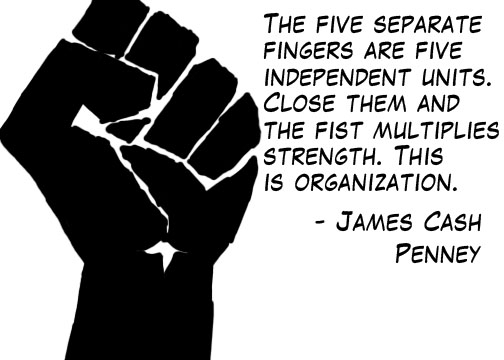 These are tag lines that came to me while developing the graphic, and I favor ‘Unite in Question’. The reason for this is unclear to me, but it has to with never stop being curious. It also has a lot to do with listening. I’d like to call it active listening, by which I personally mean listening without judgement but with intent to educate. By uniting in question, those of us aware can approach those who perpetuate the systems of bigotry, oppression, and the like in continual challenge of the beliefs they hold. It’s almost like a socratic method of combat via inquiry. We can be as children to their unfounded insistence, and continually ask ‘why?’ At each and every detail they provide. 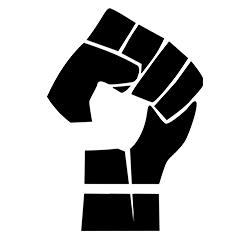 As a graphic, I think it’s highly successful in capturing not only the fist, but the question mark. They are seen at the same time, but do not compete. Instead they compliment each other. Some sharp points are balanced by spaces and abundant smoother edges. Thick, large shapes lend clarity and stability. Weight too, exists as stabilizing factor as well as balance. The fist/question form is top heavy but remains centralized on a thick enough base. If this were a 3d form it would not fall over.